Many hearing the news today from the UK High Court that a second judgment regarding the direction that the medical treatment Neon Roberts must be afforded, will be confused as to why the courts are getting involved with this matter. On the face of it, it should be straightforward and Neon should get the standard care that a child suffering his condition,medulloblastoma, should get from the NHS. However, this case is anything but straightforward because Neon’s Mother Sally, doesn’t want her son to receive the ‘standard of care’ (the care which has been demonstrated to be the optimum care possible given the currently available evidence) Sally Roberts has been quoted as having told the court she believed conventional cancer treatment was “out of date”. She said she feared radiotherapy would reduce Neon’s IQ, shorten his life, put him at risk of having strokes and make him infertile. It is of course, perfectly normal for Neon’s Mother to worry about the effects of any treatment he may receive but there is something more worrying at play here, which deserves discussing. If these cases end up in the Courts, we all have an interest in this as we, the public, pay for these cases. By the time cases reach the High Court, costs aren’t cheap. If we look more closely at Sally Robert’s comments we see a worrying aspect to this story. Her comments on the Channel4 news on Friday 22nd December show that she sees the issue as a question of the most appropriate medical treatment for her son. She seems to be questioning the care the NHS wants to offer Neon. Her primary motivation is to care for her son by not exposing him to the side effects that he might arise as a result of medical treatment. This is a caring attitude one might expect from a Mother but it signifies something else, namely Mrs. Roberts’s view of traditional medical treatment as compared to what is known as, ‘alternative’ or ‘complimentary’ treatments. Sally Robert’s said this evening, “I think it’s a very indoctrinated system, we need to explore natural therapies we seem to have ruled out. Chemotherapy and radiotherapy I certainly don’t agree with. I think its out of date…….there are many other ways we could go about this”. She adds, “thousands of children have been successfully treated with other therapies”. This is the nub of the question that the Judge had to decide on, the wishes of the Mother versus the reality of which medical treatment is appropriate. Overlay Mrs. Robert’s view that ‘alternative therapies’ are preferential and you have the need for the Law to clarify how Neon should be treated. This is a dilemma, which isn’t new. There is a Medical practitioner based in Houston, Texas who claims to have uncovered a treatment to cure brain tumours in patient’s that have exhausted the conventional treatments the US system has in its armoury against disease. The treatment is based upon the Drs belief that his treatment acts upon tumours and kills them offering cures. The clinic espouses the ‘alternative’ treatment in that it lies outside of mainstream medical opinion. There are early stage trials but no end stage studies, which demonstrate that the treatment works in the specific disease. The issue here is that it is very easy for any practitioner to claim treatment benefits without the necessary data to prove efficacy. There is much criticism directed at clinics / practitioners who advocate ‘alternative’ therapies as there is very little credible data to convince medical practitioners that a treatment works. This is the emotional trap that Sally Roberts finds herself in and she is not alone. 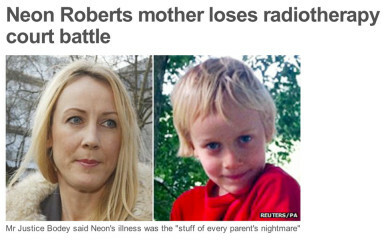 Its unfair to judge parents like Mrs. Roberts as they are absolutely desperate to find any way of keeping their kids alive. However, the reason the court had to intervene against the Mothers wishes is because there is a moral maze to navigate regarding conventional v alternative therapies. The Courts found that Neon was best served by receiving the accepted ‘standard of care’ despite his Mother advocating ‘alternative’ therapies. The Courts primary interest is that of Neon not his Mothers beliefs in unconventional therapy. This is why we need Courts advise in such matters because they are nearly always dealing with lay people with no real understanding of medicine, physiology or even a basic understanding of how their body works. ‘Alternative’ believers are often well intentioned as they are deeply involved emotionally and nearly always find it impossible to see their way through the issues. This is understandable as they are desperate but the child needs the objectivity that the Court offers as they aren’t best placed to make the judgments. Often these ‘complimentary’ methods are so expensive that parents have to sell their homes and bankrupt themselves to be able to meet the demands of these clinics. The sad reality is that if the best scientific institutions around the world have not been able to replicate the clinical results these ‘alternative’ clinics claim, it is unlikely the claims of these clinics can be substantiated. This is the sad reality of this situation. Those of us whom work in Health care know the unfortunate outcome of serious disease and its impact upon the families involved. The Neon Roberts case demonstrates the need for intervention from outside agencies, in this case the law, to advise on the best course of action.Despite the best intentions of some parents, they are too close to the situation to be able to make a rationale judgment. In Neon’s case the Law helped make the decision for him. Sadly, many people lose their life savings and assets to cling to hope that their child/relative will find something in these alternative treatments. Until they can demonstrate their value in well-constructed clinical trials, which then get the appropriate approvals, people will need the help of the Law to guide them.